Conan O'Brien isn't just leaving the Tonight Show, he's also being excised from NBC's corporate propaganda. The embittered late-night ginger's already dead to corporate headquarters, judging by the mural in the lobby. Click through for before and after shots. 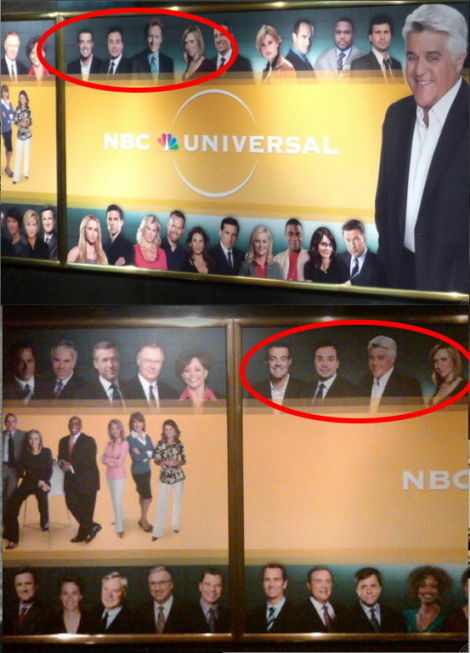 The "before" shot is from an October 2009 entry in NBC employee Dennis Degan's Flickr stream; the "after" comes courtesy Mediaite editor and 30 Rockefeller Plaza ghost Rachel Sklar, who first noted the mural change on her Twitter account today. 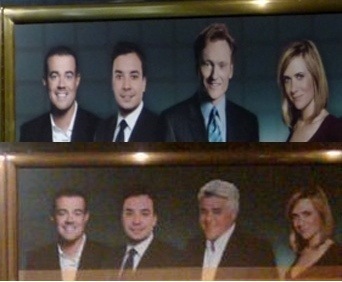 As you can see in the composite below, O'Brien's head has been replaced by Leno's. But Tonight Show returnee Leno did not emerge unscathed from the mural changes, either: according to Sklar, that giant picture of him in the foreground has been eliminated, though you can't see it in the "after" shot due to cropping. Better call your publicist, Jay.